Amr Sindi began his passion for watches from the tender age of 5 when he received a Flik Flak from his grandparents. After graduating from college with too much time on his hands (no pun intended), Amr joined TimeZone.com where he furthered his knowledge on the art and science of watchmaking. Soon after, Amr become a moderator of TimeZone.com's Official Hublot forum; a role he continues today. After taking his passion a step further and working full-time for Hublot, Amr decided to set out on his own horological adventure and thus The Horophile was born. 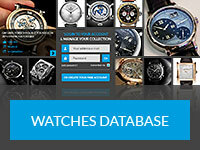 You can find Amr's work on his personal blog TheHorophile.com, as well as WatchAnish.com and TimeZone.com.